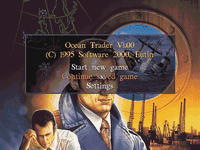 In Ocean Trader you control a maritime trading company and your purpose is to make money by dealing in various goods to and from the 100 harbors available in the game. There are 32 different goods whose prices fluctuate in the various harbors. You can also choose to design your ships but you must spend your money wisely! One little misfortune such as an embargo can cripple you .